Forget Self Defense. This is Self Offense. Why is this self-offense and not self-defense? Our fighting system is not a system of self “defense.” But rather we train and teach self OFFENSE. We don’t believe in approaching any situation with the passive mentality of being the victim. That kind of thinking is outdated and instantly gives the attacker the advantage, regardless of your skill level or years of training. Think about it: your opponent isn’t thinking passively or defensively, so why the hell would you? We know that having an aggressive mindset can put us in the driver’s seat instantaneously. You must attack the attacker. Make the hunter become the hunted. This goes beyond just an attitude. It also filters into our techniques and physical movements. Every move we make is designed to be as efficient and destructive as possible. There is no beating around the bush. There is no blocking. There are no passive moves whatsoever. From the very first moment of the attack, we take back the upper hand. We own the advantages. Self OFFENSE. What would you do in a real street fight? Could you protect yourself and your loved ones from harm? The streets aren’t safe. And these days, it’s not enough to know a few moves. You need a tested fighting system that gives you the upper hand if you find yourself in a fight in Los Angeles. A fighting system on steroids. Welcome to ICE Urban Combat. This is the science of street fighting. At our renowned LA facility we’ve helped thousands of individuals gain real fighting confidence and feel in control on the streets. We’re located in Newbury Park, Thousand Oaks. Now, you can get ICE Urban Combat — the world’s most effective fighting system — anytime, anywhere. Attend our self defense classes for women & men and see the difference. Anyone can learn this system! No other martial arts or self-defense system compares! 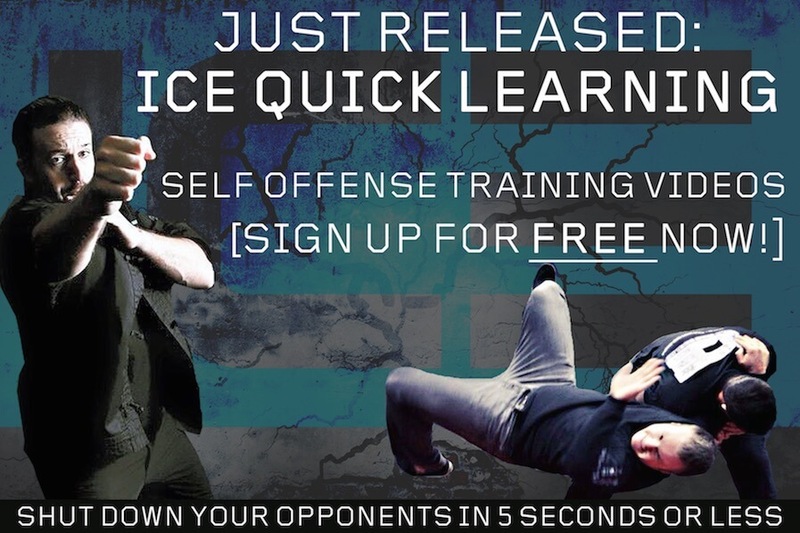 Work online at your own pace with easy to follow videos and course guides, and get one-on-one access to expert ICE instructors on this one-of-a-kind self-defense course. Learn why ICE Urban Combat is the most efficient fighting system in the world. Learn more! Get the complete 3-month training program for only $59 today! How to immediately gain the advantage in a real street fight. How to develop efficient striking that will violently and abruptly end any altercation. How to fight in all positions, from standing to the ground. How to develop explosive speed and destructive power with pinpoint accuracy and precision. 6 Week Beginner Course starting October 4th! 6 Week Beginner Course starting August 6th! Find out why blocking is not a good idea in a street-fight. Develop destructive low-line kicks that will fold people in half. Learn how to trap to dominate in close-range. Learn how to smother a knife attacker, rendering him completely useless. Unveil the best physical weapon your body has to offer. Our simple and practical techniques give you a mechanical advantage over your attacker, regardless of his size, strength or fighting skills. This approach allows you to shut down your opponent and end a fight in 5 seconds or less! Get started now. Join for free today!